1.) 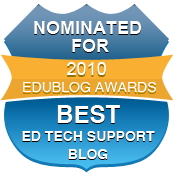 An EdTech Tip for Administrators - Read Some Blogs!!! 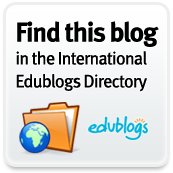 - My suggestion to administrators to subscribe to some excellent blogs that administrators are writing. 2.) 3 Essential Windows 7 Tools - Did this for some schools in my district, thought I would share here as well. 3.) No More FLIP Across the Curriculum - My reaction and alternatives to the discontinued manufacturing of FLIP Cameras. 4.) An EdTech Tip for Administrators - Wallwisher - How to use Wallwisher with your faculty and staff. 5.) 10 Wikis Worth Checking Out - Written March 30th, but received hundreds of visits, so I thought I could still share it since it was written so close to the end of the month. "HippoCampus is a project of the Monterey Institute for Technology and Education (MITE). The goal of HippoCampus is to provide high-quality, multimedia content on general education subjects to high school and college students free of charge." HippoCampus would be a valuable addition to a classroom or for students who are interested in taking their learning a step further. Teachers can use the site as a supplement to their teaching or create a Custom HippCampus page for their students. Several screenshots are available to showcase what the website looks like and how students can interact with the software. There are several valuable lessons free of charge for teachers. I could see this being used on days that teachers had a substitute teacher as well. Check it out and see if any of your classes are available. BrainCog is a free online assessment website. Educators can create a free account during the Beta testing period and you will have access to a dashboard that allows you to test students online. When you sign up you provide all the usual information. The difference is you also create a specific BrainCog URL that students will use to access the assessments. A confirmation email is required for registration. With each assessment you will be provided reports so that you can see student progress. Assessments are limited to multiple choice, but each test can also be a timed test, which is important for ACT and AP test preparation. You can easily import student rosters into the site as well. For each test you provide an intro message, a fail message, a pass message, and an email reminder. Several valuable tools that would be worth trying with students to see how the program could work in your classroom. BrainCog is worth signing up for while it is still in Beta. "Conovate is a platform for real-time assessment, analysis and reporting of student performance by skill and over time. Our free teaching tools are easy to use, reduce paperwork, and can be used to supplement and assess learning in and out of class, providing instant access to student progress for individualized instruction." It is provided on an Open Source Platform, so it will be free for teachers, students, and schools. It is currently in Beta, so you would have to sign up to be added to a list. Through Conovate, teachers can create quizzes and students can take them online or they can be printed off and copied. Since it is like a community, teachers can find questions that other teachers have created. The benefit will be that it allows teachers to track student responses and gauge the time they spend on each question (if they do them online I assume), therefore learning where students are struggling, and then provide intervention. To learn a little more visit their main site and see the features available for teachers and parents. There is also a Prezi that explains what they intend for the website to do. It will be interesting to see what becomes of this Conovate. Teaching AP next year, I could see this being used to see where students stand. If students are working on a project, this would be a great way to prepare it and share it with teachers and students. It can easily be embedded to a blog or website as well. When you create your flip book you have the option of four different styles. You can choose the size, background color, etc. The premium version allows download and embedding without a watermark. You can see a sample of one of my PDF's below.